Poringland is a long unattractive village which lies 5 miles south of Norwich - between Arminghall and Brooke. Essentially a commuter zone for Norwich, it retains little character although there are some older houses and cottages close to All Saints Church. W.G. Sebald lived at the Old Rectory on Upgate here for many years - prior to his tragic death in a car accident in 2001. 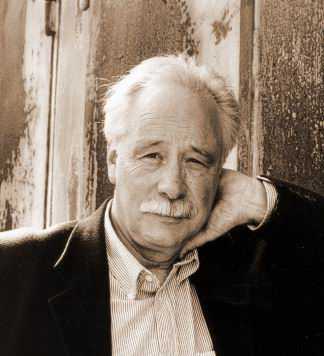 Sebald was born in Bavaria in 1944 and was educated in Germany, Switzerland and in Manchester. In 1970 he gained a lectureship at the University of East Anglia - where he remained until his death in 2001. He was also the founder of the British Centre for Literary Translation. Sebald's father fought in the German army during World War Two and returned home from a French POW camp when Sebald was 3 years old. European history shapes much of Sebald's work and, in particular, what he saw as the German people's 'forgetfulness' in relation to the war and the holocaust. One of his works - The Rings of Saturn is an account of a journey through East Anglia. It is not a traditional novel but a meditation - with photographs - combining history and travel writing. The narrative touches upon a number of other writers who lived in East Anglia including: Sir Thomas Browne, Edward Fitzgerald (see Merton) and A.C. Swinburne. The book was originally written in German and then translated into English by Michael Hulse. The 'bishop's park' referred to is the grounds of The White House which lies at the far end of Upgate and is the residence of the Roman Catholic Bishop of East Anglia. At the lower end of the park flows the River Chet - barely more than a stream at this point. Sebald is buried in the graveyard of St. Andrew's Church at Framingham Earl - which lies about half a mile from the Rectory. For a specifically designated dog-fouling site on the recreation ground. In connection with the removal of turf from the bowling green. Poringland also features in one of my long Norfolk dialect poems called The Boundry Dispoot - under the guise of Little Waddingham. 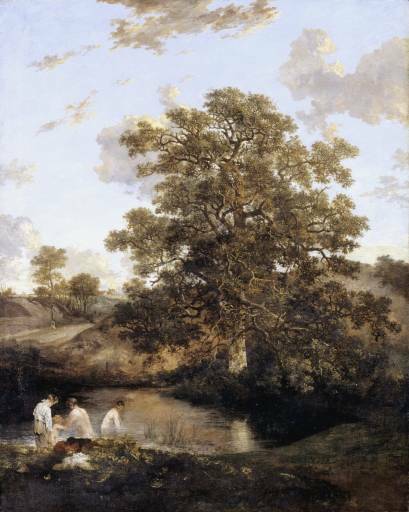 Poringland, however, is probably best known for providing the location for John Crome's painting The Poringland Oak - painted circa 1818-1820. It is thought that the pond was located at Carr Lane, just off the main village street. There is still a pond there today - although it is now part of somebody's garden. On the horizon of the painting can be seen a church tower - which could easily be All Saints Church. The painting now resides in the Tate Gallery in London. Poringland village sign depicts Crome at work on his famous painting.